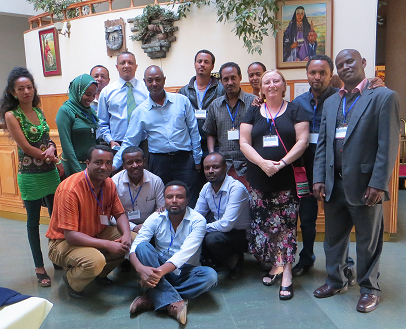 A SLIPTA programme auditors training was conducted for fifteen participants from 26-30 May 2014 in Adama, Ethiopia. Two master SLIPTA auditor trainers provided didactic instruction, facilitated discussions, led the mock laboratory audits and provided feedback to participants to improve laboratory assessment skills. The workshop was designed to engage the participants in improving the quality of laboratories across Ethiopia, with an emphasis on helping laboratories achieve accreditation. For more information about SLIPTA, please visit www.ASLM.org/SLIPTA. Participants displayed keen interest throughout the course and remained actively engaged in activities, assignments, and mock audit practice. The mock audits were performed at the Adama Regional Public Health Regional Referral and Adama General Hospital & Teaching College Laboratories. To learn more about ASLM’s implementation of SLIPTA.